What a successful event the recent Edenbridge Hospital Fete was. Not only did most of Edenbridge seem to be present but the sun was shining and everyone was having fun. 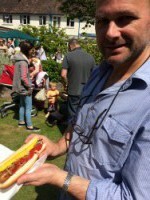 The Edenbridge Rugby Club were selling delicious hot dogs and the queue to their stall didn’t seem to stop! Congratulations to all those who took part in the organisation – you did the Hospital proud. I have been especially busy over the last couple of months now wearing two hats; one working with Laura as co-presenter of The Community Show which she presents on Channel Radio. For those readers who haven’t picked up on this yet, we present a live radio show every Thursday between 10-11am covering all things community, charity and fundraising across Kent and the county borders and we give mentions and promotions to community events, etc. This is internet radio and you can tune in to our show at www.channelradio.co.uk. My second hat of course is as The Barrister Broker, helping people avoid the cost of solicitors by providing them with an alternative way to deal with their legal issues quickly and cost-effectively. For the benefit of new readers to my column I am not a lawyer and cannot give legal advice. I am a freelance barristers’ clerk and facilitator enabling people requiring legal services to have direct access to a barrister – the legal expert – instead of going to a solicitor. The benefits in using the direct services of barristers are their legal expertise and lower cost. With much lower overheads than solicitors and different ways of working, barristers make a very cost-effective and value for money legal solution indeed, as my many client testimonials on my website show. Take a look at www.thebarristerbroker.com. Whilst the vast majority of my work relates to “who gets what” following divorce or a non-married relationship breakdown (i.e. the distribution of the family assets – house, car, money, etc.) and child arrangements (contact and residence of the children) my latest success involved the driving offence of speeding. A gentleman contacted me in urgent need of legal advice and representation at Sevenoaks Magistrates Court. He was charged with driving at 103 mph on the M25 (Clacket Lane). It was not his intention to dispute the charge but he obviously wanted to avoid a driving ban as speeds over 100mph are in line for a ban. I arranged for my client to have a meeting here in Edenbridge with a senior barrister specialising in road traffic law a couple of days after our initial phone call, who then represented him in court a few days after. Thanks to the barrister’s expert knowledge and skilful mitigation, the result was that the client avoided a ban altogether. Mission accomplished. As one might imagine, the client was relieved beyond belief and extremely grateful that I had arranged matters not only so quickly but had given him a barrister who, in the client’s own words “knew exactly what he was doing”! For a local, compassionate and professional service, contact me in confidence on 01732 866 562. Remember, speaking to me costs nothing but I could end up saving you thousands!